One thing we love about our company is we are open and honest and we work towards a better future. We stand by our rubbish removal work and appreciate the trust others have placed in us. When you choose us for your junk removal, you are choosing us because you trust us and you want to support a local and small business. It’s the greatest in compliments when our clients use us over and over. We show that appreciation by also supporting our local community. We give a portion of our proceeds towards the charities below. Thank you so much for your patronage and your support. Spartan Junk Removal is an A+ accredited BBB business. We are focused on creating the be Junk Removal Experience for all our customers. Call or schedule online today to take care of your junk removal needs! Ranked on over 25 variables, and against over 250 different Junk Removal Companies, we are proud to announce Spartan Junk Removal has been voted on of the top MD Junk Removal Companies by Expertise.com! Working with Habitat for Humanity helps provide safe secure housing for underprivileged individuals, and we are proud to help work with this great cause. Sustainablity is important to us, and that's why we are recognized by the state of Maryland for putting top quality environmental practices to work. We are honored to work with the MD Food Bank to help feed all those in need. With your help we continue to improve the life of all Marylanders! 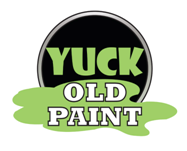 Yuck Old Paint safely removes and eco-disposes your old paint cans, and is the only company offering a non-dumping solution to the disposal of old paint cans.